With the exception of my beloved Robert Kroetsch, Don McKay is probably the greatest, most skillful Canadian poet I've read thus far. 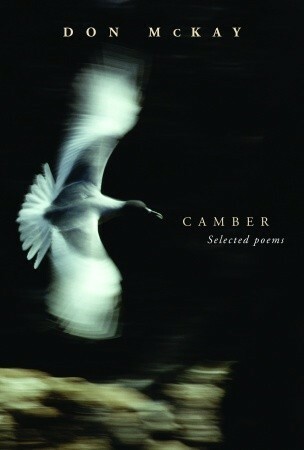 And because Camber is a "collected works," spanning the last twenty-plus years of the poet's career, it allows one to gain an appreciation for the depth and versatility of his work. McKay tends to be placed in the eco-poetry camp (and with good reason), but he exercises an equally deft hand in the anthropological realm. Thus, although this collection contains its fair share of bird and nature poems, it also tackles such sundry topoi as jazz percussion ("Setting up the Drums"), automobiles ("Ode to My Car") and kitchen utensils ("Setting the Table").However, McKay's most impressive strength as a poet lies in his genius for metaphor and comparison. For him, the simple act of turning on the kitchen faucet is imbued with magic and mystery: "an underground river leaps sixty feet into your mouth, a perfectly composed dream" ("Nocturne MacDonald-Cartier Freeway"). Elsewhere, a wintry sunset finds "evening […] bleeding inward from the bowl's edge, blue- / black with the heavy hint of snow" ("Midwintering"). And in "Kestrels," the heart is pertinently described as "that paraplegic bird." I'm of the belief that a successful metaphor makes a stereogram out of reality, forces the reader to apprehend the world in a way that is fresh and defamiliarizing. At his best, then, McKay tenders us a key with which to unlock the doors of perception.Yet because of the density of this poetry, Camber's length—just over 200 pages—can be overwhelming. These poems are best taken slowly, so that there's time to digest them; unfortunately, the format of the "collected works" (voluminous, claustrophobic) isn't always best suited to such a mode of reading. For that reason, I'd like to check out some of the individual collections, like Night Field or Apparatus. This book of poetry collects poems from Don McKay's career between 1983 and 2000. If there was any doubt that McKay has a long tradition as a nature poet, look no further. In some ways, his approach to nature poetry can be seen as a reaction to Romantic poetry's notions of nature (after this book was published, McKay ditched the "nature poet" label and donned (hehe) the title "geo poet" - a subtle but meaningful difference). In the Romantic tradition, nature is fully integrated into the human story, and even supports it. Romantic poets are known for idling in nature to gain great epiphanies and insights. In this sense, nature is a tool for advancing human ends; even if the intentions are good, humans are still in the leading role. McKay interrupts this understanding by admitting that the natural world (the whole world, for that matter) contains a wilderness which cannot be incorporated into the human story - it is utterly beyond it and cannot be reduced by the human mind to something manageable. From this comes a sort of reverence for the natural world on its own terms, not merely ours. In McKay's poetry, metaphor serves as a tool that keeps our language's bad tendencies in check: the tendency to reduce everything to a name, and believe that the object itself can be understood through that name. Metaphor does not redeem language, but it brings it closer to seeing things as they are: metaphor shows that straightforward language cannot completely explain the world, and shows that there is an understanding / form of knowing beyond rationality. This humbling of the human ego is something that is necessary if we are to live well in the world.This book of poems is consistently good, and is required reading for anyone who wants a fuller view of McKay's poetic career. It's also nice, since, like most poetry collections, the books that this one draws from are out of print. Currently writing an essay on poems within this collection - it's absolutely brilliant (the poems, not my essay). I've barely even scratched the surface of all that could be said about this poetry. I absolutely love McKay's view of nature and the wilderness, it's quite different to anything I've come across thus far. His ideas about language - how we can never fully understand the true language of wilderness, and thus all our language is translation - is, I find, a quite optimistic view in contrast to postmodernism's common notion of language. He uses this idea brilliantly in his poetry, always self-consciously calling attention to the use of language in really unique and interesting ways.I'm obviously bringing a lot from academic readings of his poetry into my review of it. From a personal, non-academic point of view, I still adore it. There's something so beautiful about his connection to nature, how he writes about home, and so many other things. I really felt quite a visceral attachment to some of these poems, particularly the ones the later collections. (I gave this 4/5 stars because the earlier poems didn't quite capture me as well as the later ones. )Overall, fantastic poetry, which I think I'll be coming back to again and again. A wonderfully haunting collection of poetry from a master poet. I have immense respect for poets, as its a field I cannot comprehend writing in the slightest. Kudos. I am writing my masters essay on mckay - I will probably learn more from this book than any other. Don Mckay - Don McKay is an award-winning Canadian poet, editor, and educator.McKay was educated at the University of Western Ontario and the University of Wales, where he earned his PhD in 1971. He taught creative writing and English for 27 years in universities including the University of Western Ontario and the University of New Brunswick.In June 2007, he won the Griffin Poetry Prize for Strike/Slip (2006). He is the co-founder and manuscript reader for Brick Books, one of Canada's leading poetry presses, and was editor of the literary journal The Fiddlehead from 1991-96. In 2008, he was made a Member of the Order of Canada.